As we know there are many kinds of hammocks available on the market, such as camping hammocks, hanging chairs and porch swings. If you have a traditional hammock it is sure you have to find two trees or posts in order to use it. They need external support. This is a real challenge to find two trees in the nature which are close enough to each other to set up your hammock. It is also true for your backyard but if you choose a hammock with stand you do not need to wonder about the distance between trees again. The Vivere Double Hammock with Space-Saving Steel Stand comes with a space-saving steel stand and a double hammock in your choice of cotton, polyester or weather-resistant Sunbrella fabric. You’ll enjoy the freedom that the 9-foot stand provides by allowing you to set up your hammock in the most convenient location without having to rely on attaching your hammock to two trees. Accommodates up to two adults. Learn more here. Hammocks have a rich tradition that has spanned over centuries and is mainly found in South American, Caribbean, and Yucatán cultures. The art of crafting hammocks has been passed down from generation to generation and has today become a widely popular piece of furniture around the world. Today, are still primarily used by the tribes in Central America but their purpose has spread to those who are in search of relaxation. Nowadays, this furniture is highly popular among campers and hikers as a hammock serves as a makeshift bed that offers protection against the wet ground and other sorts of bugs and pests. They provide a soft place to rest without worrying about finding a flat plane to put a tent or sleeping bag . This genius invention found its way from North Central America through a vast network of trade routes and was exchanged in the old days with other materials like fire, food, and construction items. It is also believed that the idea of hammocks was stolen by America from the native Indians as they were pushed out of their homes. Modern hammocks are the result of the evolution in design and are now based on the construction of tightly wound threads that provide an increased level of comfort. Usually, the size of a hammock is the most important factor that determines its comfort level, but other elements play their roles as well. If you have never slept away the afternoon or spend a night underneath the starry skies while lying down in a hammock, then you probably don’t know what an enjoyable experience you’ve missed out on. In the first glimpse, this furniture may look like something that’s the whole purpose is to swing; but be assured that they are a lot more comfortable than they look. A hammock with stands, also known as free standing hammocks, makes your hammock much more functional and gives it more usability. This means that you can easily set it up wherever you want. It is easily portable so you can use it outdoor and indoor too without any trouble. If you would like to enjoy the sunshine and read you favorite book or you prefer to relax or sleep in cool shadow you can grab it and put is anywhere you want. Comfort: The first criterion that hammock buyers want to fulfill is the element of comfort. A hammock is barely of any use if it is uncomfortable and does not allow you to rest easy in style. Be it an indoor hammock or a camping hammock, comfort is an absolute must because, without it, you may as well be resting on a chair or in any other ordinary place. The high-quality hammock is made of comfortable fabric like cotton or parachute nylon that offers long-lasting durability as well as comfort to satiate your desire for ultimate relaxation. So, pay close attention to the material quality and type whenever before you make the purchase. Weight: The weight of the hammock frame plays a huge role in determining its overall value particularly if you will be moving the free standing hammock around your yard. 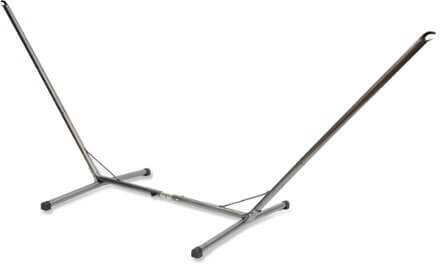 The last thing you’d want is a self standing hammock that you cannot move around. 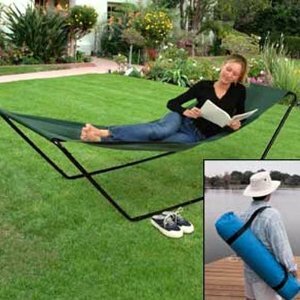 Hammock stands and hammock frames usually come made with all resin steel, coated steel or aluminum and weigh approximately 25 – 35 pounds. Durability: This is perhaps the second most important consideration that people must take into account while buying a hammock. 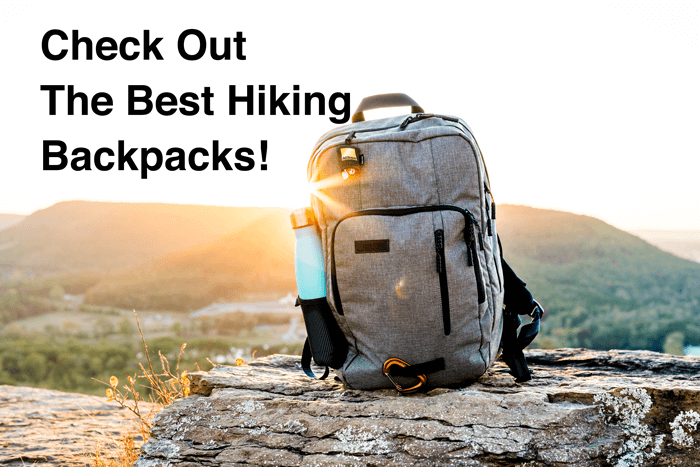 Since most people prefer buying these items to take along with them on camping trips or other outdoor activities, it becomes necessary for them to use it even during harsh weather conditions like rain or snow fall. The finest quality hammocks are made of “A” grade fabric that is weather resistant and barely show the effects of wear and tear after it has been used in tough weather situations. The fabric should also be easy to clean because resources are scarce in the outdoors and most of the time you’ll only have soap and water at your disposal. Versatility: A hammock’s purpose is not only limited to serving as a bed on camping trips; it can also be used at home to spend a relaxing evening watching the sun go down. Hammocks that are meant to be hung outdoors are usually constructed with material that withstands the effects of the weather without fading or mildewing. There are also hammocks made of less expensive material that is supposed to be used in a sheltered location; these items still provide some weather resistance and are usually made out of spun polyester rope, which is still more resistant to cotton rope. The hammocks that are meant to be exclusively used inside are made of a variety of materials including soft spun polyester fabric and cotton rope in many colorful variations. Cost: The good thing about free standing hammocks is that you don’t have to shell out a fortune to buy one. Most products belonging to reputed brands come in a pocket-friendly price and range between $50-$300. Sure, there are more expensive variants available that either offer better durability and more space, but most people do not require such items for personal usage. If however, you plan to use your hammock and stand extensively and wanted to last for many years, it makes sense to make a significant one-time investment rather than every few years buying newer products. Finding the perfect balance between price and quality should be your first consideration when looking for a hammock. Weight: As discussed earlier, the weight of a hammock with stand plays a huge role in its desirability. If you haven’t used hammocks before, you might believe that an extra few ounces will barely cause a problem. But in reality, these additional ounces will weigh heavily on your shoulders whenever you are traveling on foot or hiking up a mountain. Your intention should always be to find a sturdy hammock that is light in weight and can be comfortably packed into a small pouch . Unless you have already decided to purchase a rather heavier hammock because of whatever reason, we would recommend that you go for hammocks with ultra light slings or a larger sized two-person hammock that are ideal for the outdoors. Dimensions: As a general rule of thumb, it can be said that there is a strong correlation between the width of a hammock and comfort level. Larger hammocks with stands provide a feeling of being snug inside that is missing from their smaller counterparts. Support is imperative when it comes to sleeping hammocks, going for a wider version even if it means being a bit extra is completely worth the investment. You can buy a double hammock that accommodates two others or only use it to sleep alone for the extra snug feeling. Day use hammocks usually do not offer much space because people just use them to lounge inside of their homes or the front lawn/backyard. Choose a hammock size depending on your intentions of usage. Strength: Unless you’re choosing a free standing hammock made from durable material, you may be risking serious injury because inferior quality hammocks do snap! There are dozens of reported incidents where customers of complained that their hammocks just outright snapped, being unable to bear their weight. The finest quality hammocks are made of durable material like parachute nylon or polyester that is resistant to weather effects and promised to last many decades with proper care. Never compromise on the fabric quality for the sake of saving money because who knows, you may end up causing serious damage to your body and finances in case an accident happens. Only go for trusted manufacturers that have a reputation for making durable products that provide both the required strength and comfort to be worthy of purchase. Capacity: Again, your choice for a hammock will also depend on its ability. But first, you must ask yourself are you looking for a hammock for solo travel or do you want to fit in somebody else as well? Double hammocks are usually larger in size and provide greater comfort when used by a single person; on the downside, these hammocks are heavier in weight and may be difficult to carry on extended trips. It is important to know the weight limit of every hammock if you want to buy one that would best suit your requirement. There are also family size hammocks available for those who travel in groups. Best Use: At the end of the day, it all comes down to your purpose of using a hammock. Will you use it to sleep at night amidst the wilderness or carry it to the beach for plain and straightforward lounging? There are specific characteristics that are better suited to different purposes, and it would be in your best interest to keep them in mind. If you want a hammock for indoor or casual use, then the cotton made hammock would suit your purpose just fine, but if you want something more durable to use it outdoors, parachute nylon and polyethene are the best choices of fabrics. You may also want to purchase a hammock shelter or tarp to protect the hammock from weather effects and protect yourself from mosquitoes and other bugs when you are camping outside. Hammocks with stands or free standing hammocks offer many significant advantages apart from being lightweight and affordable. This equipment is highly portable and can be easily carried from one place to another. 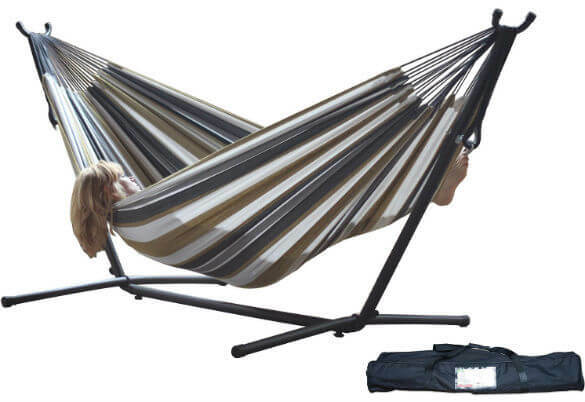 Hammocks with stands can be easily assembled; they are much easier to assemble than a tent and are available in various shades of colors as well as many different fabrics. They can last for decades if proper care is taken, and is the ideal resting tool if you just want to relax and spend a lazy day doing nothing. To buy the perfect hammock with stand, follow the tips that we’ve mentioned above and you should be ready purchase a hammock that will last you a lifetime.